Summary: Many people aren’t aware that makeup can cause eye infections and other problematic issues if used incorrectly. One of the staples in today’s beauty industry is makeup. It enhances the physical features and traits of an individual and is used on a daily basis. 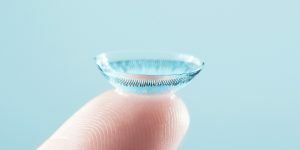 However, if you wear contact lenses, it’s important to understand that what you purchase, how you care for your makeup, and how you apply it can all have an affect on the eyes. Even if the product that you purchase is to your liking, you could be causing damage to your eyes without even knowing it. Regardless of whether you use makeup every day or once in a while, here are some common mistakes that people make when applying their makeup. The eyeliner that you purchased at your store or through an online order might look gorgeous, but you also need to be aware of the ingredients that are within them. Certain manufacturers put ingredients in their product to help achieve a specific color or preserve them. Ingredients like sulfates and lead may irritate the eye and can even be harmful to the body if exposed. If possible, Lens.com recommends that you avoid these ingredients and search for a brand that uses healthy and natural materials. If you’re short on makeup and decide to pull out some expired products, you could potentially cause significant harm to your eyes. It should not be any different when it comes to makeup products. When justify for lengthy periods of time, makeup can start to go bad and you run the risk of causing infections.